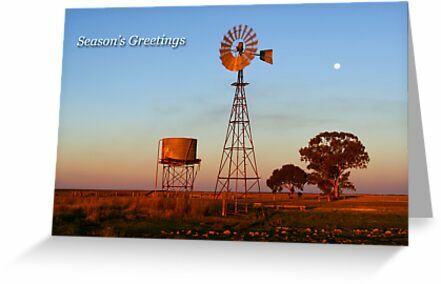 Season's Greetings cards are a terrific gift giving idea and let us save you valuable shopping time by offering a collection of eye-catching designs. 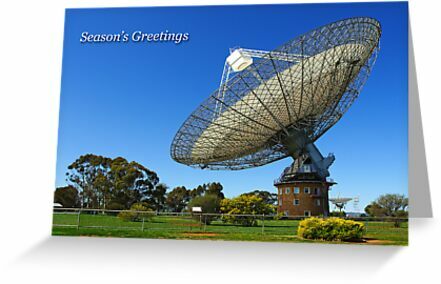 We've included the words "Season's Greetings" on the front of all our cards so they can be used regardless of religious circumstances. 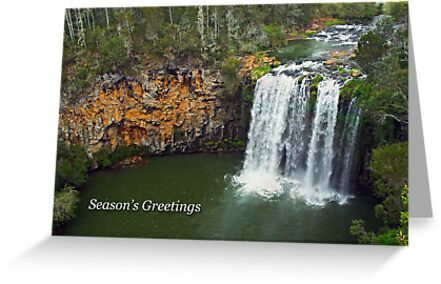 Each greeting card is 300gsm with a satin finish, and blank on the inside so you can tailor your special message to the recipient. Each card is supplied with a white envelope. Purchase 16+ cards and receive a massive 30% discount. And the great thing is, you can purchase different card designs to make up your 16+ cards to receive the discount. How good is that? So what are you waiting for? 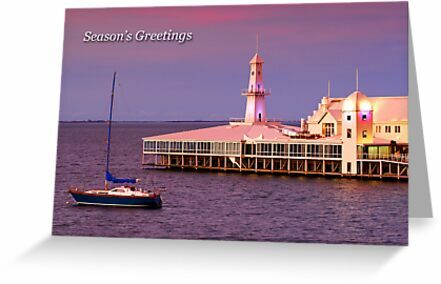 Check out our Season's Greetings card designs today and make your purchase. You will be glad we saved you another trip to the shopping centre. In a world where the workforce is having to continually adapt to change, it's imperative to consider employing experienced people who have a breadth of knowledge and skills that can be drawn upon by younger people within a business or company. By doing so, positive action can be taken to building a rounded team where ideas are shared for the betterment of the business or company and their clients. Mature-aged job seekers who may be experiencing unforeseen circumstances where they now need to find alternative employment, can bring their life experiences and talents to a new work environment and positively contribute to increased sales, performance and reputation. Australia is currently going through a workforce transition where thousands of manufacturing and media positions are being made redundant, so this presents exciting opportunities for those who want to change career and possibly enrol in some form of course or training. There are numerous benefits to employing mature-aged staff into positions where the clients of a business may prefer to engage with people of similar age. This is something that employers need to consider because it can lead to word-of-mouth referrals and increased sales. Mature-aged job seekers will most likely have a sound background in volunteering and contributing in some way to the community. Regard this highly because it is a clear indication that they are willing to make a positive difference for others. Life achievements, awards, and continued learning are also factors to consider as these demonstrate active participation and initiative. I am happy to know your views about this topic and invite your comments. 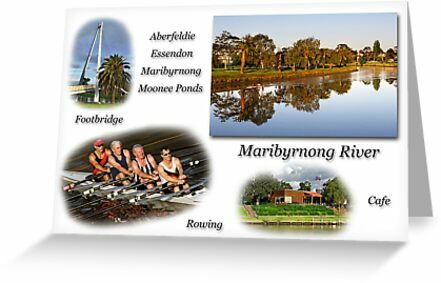 The Maribyrnong River meanders its way through Melbourne's north-west suburbs and is a fantastic recreational area. As a local or tourist visiting the area you will find an excellent walking circuit that crosses the the Afton Street Footbridge. For those who enjoy coffee, a stop at the Boathouse Cafe will provide the option of dining indoors or outdoors. The outdoor timber deck area directly overlooks the river and is the place to be on a sunny day. 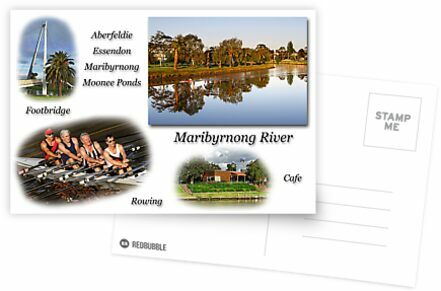 You can learn to row at the Essendon Rowing Club, where they conduct learning sessions for all ages. There's parks with BBQs, playgrounds, and a whole lot more. Lots of great options to suit your budget and a great gift idea for a friend or relative. 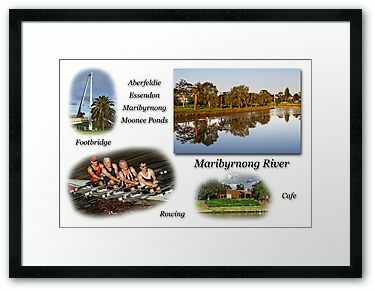 View all the new Maribyrnong River photographic print product options. 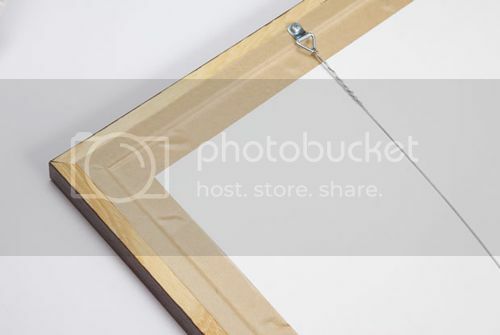 These products are also suitable for displaying and selling in cafes, restaurants, newsagencies, gift shops, and other retail outlets. 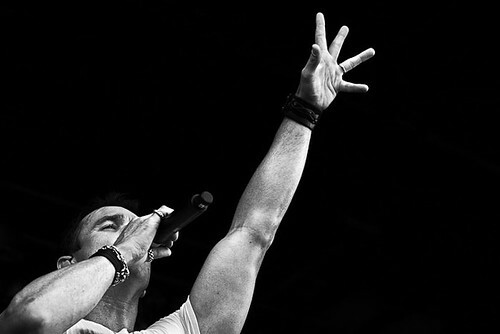 There was something that just made me process this unique image of Shannon Noll in black and white. Generally I'm not one to process images in black and white, however this photograph of Shannon seems well suited to the style. With him reaching skyward and belting out a song, the raw energy and emotion he displays while performing makes you want to listen to LOUD. For someone who actively participates in photography, it can be a fulfilling experience to connect with a like-minded person and achieve goals as part of a photography mentoring partnership. As an amateur photographer, you can further develop your knowledge by discussing your plans with a more experienced photographer who is willing to share knowledge and ideas, and exchange wisdom and thoughts. You can improve your photographic knowledge and fast-track your learning, by initiating a photography mentoring partnership with a mentor who will facilitate positive discussion and support you to achieve agreed goals. Photography is a continuing learning experience because it provides you with exciting opportunities to further develop your skills, increase your network, and share your newly created images. As a photographer, you can discover new insights with a photography mentor who will provide you with constructive feedback and advice. Over the years I have been mentored by people who have successfully facilitated my growth, and they did so by encouraging me to set realistic goals and discover information. My mentors did not attempt to solve problems. We discussed my goals and they encouraged me to initiate my journey to improving my knowledge and skills. In the 1990s, I was mentored by a former secondary school teacher. Our common interest was playing golf at the local club, and in particular the Rules of Golf. My goal was to achieve Club Level Rules Accreditation, and my mentor and I participated in a mentoring process during planned meetings where we discussed how I could achieve my goal. Our mentoring partnership was conducted over four months and I achieved the rules accreditation that I wanted with a perfect score of 50 out of 50, which was better than my mentor achieved! My mentor was highly skilled at the rules of golf and his achievements included officiating at the Australian Open and other professional events, and numerous amateur tournaments at national, state and local level. During the early stages of developing my photography business I was involved in a mentoring partnership for six months as part of the New Enterprise Incentive Scheme. My specific mentoring goal was to increase sales of my framed prints, cards and calendars. My mentor and I discussed how developing and implementing a marketing plan would help me to achieve my goal. We achieved success because we completed a planned process that included an achievable goal. My mentor held qualifications in business and marketing, and she was successful in her own business pursuits as well as being a TAFE trainer and mentor. Photography mentoring is an enjoyable learning process where a less experienced photographer can initiate a mentoring partnership with a more experienced photographer. As a professional photographer, I have knowledge and skills that I'm willing to share with amateur photographers who want to improve their photography knowledge and skills. As a photographer who wants to advance your standard of photography, I invite you to contact me by email or phone. We can discuss your photography mentoring needs so you can create your new photography pathway. Further details about my photography mentoring service are located on the "Mentoring" page. 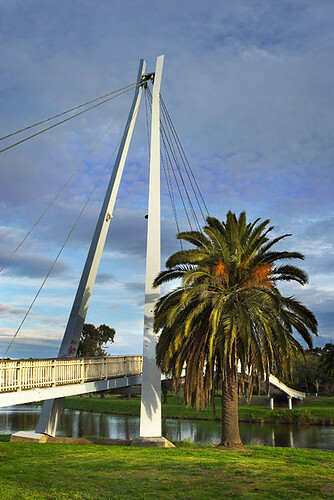 The Afton Street Footbridge is a hugely popular crossing point over the Maribyrnong River at Essendon. 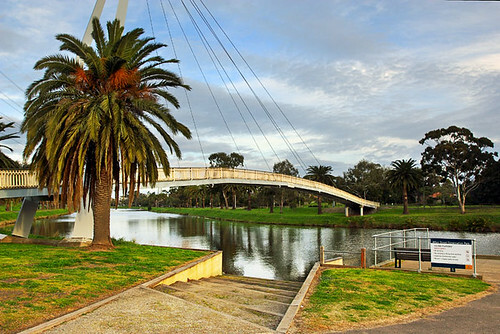 As part of the Maribyrnong River Loop Walk, the bridge offers excellent views both in an easterly and westerly direction. I walk regularly in this area and find it to be a a haven in suburbia. 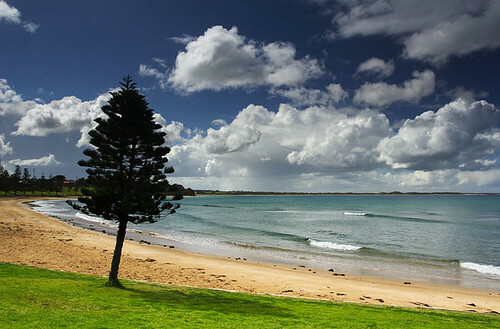 The walking path follows the twists and turns of the river and a feature along the shore is the magnificent palm trees. From a photographic viewpoint, these images were taken during the afternoon from the north side of the river. Directly adjacent to the bridge is a car park, and it can be accessed from The Boulevarde and Afton Street. So what's a good way to slow down a photographer who madly dashes around with their camera snapping as many subjects as possible? Suggest to them that they use a tripod. Photography is an art form, and for those who are serious about wanting to improve their landscape photography, I highly recommend using a tripod. One of the key benefits of using a tripod is that it slows the image making process whereby giving us time to analyse the scene and think creatively about it. We should be mindful of how we compose our images because it is critical in the image making process to producing interesting looking photographs. And that's what we all seek to do. 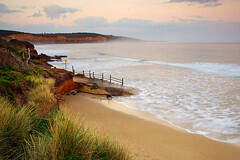 The Surf Coast area along the Great Ocean Road in Victoria is one of my favourite locations for photography. I believe the stretch from Point Danger at Torquay through to Jan Juc is perfect for experimenting with landscape photography techniques that require using a tripod. 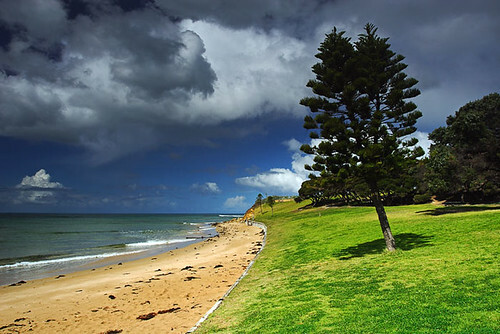 During the last few years I have taken a series of images in the same area at Rocky Point, Torquay. In making each image, I have mounted my camera on the tripod and photographed the scene using different exposure settings. The reason I return to this location and photograph it, is that I can create a collection of photographs that features the same area and produce different looking images. I do this by using various camera and composition techniques, and by using my tripod. Freezing and blurring water movement are creative techniques that require different shutter speeds. Longer shutter speeds allow us to produce images that blur the movement of water, whereas faster shutters speeds freeze the water movement. In image #1 and #2, I have chosen to freeze the movement of the water. My objective in these images was to create leading lines in the wet sand and water, whilst also emphasising the jagged rocks and the fine weather. 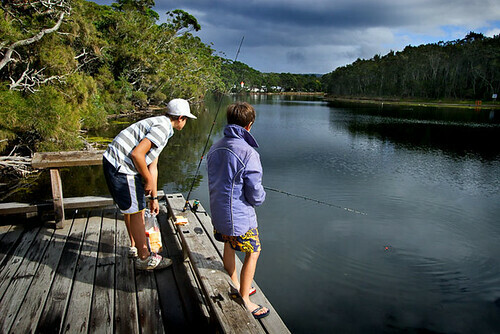 During the day in sunny conditions, it can be difficult to slow the shutter speed and blurring the movement of water. 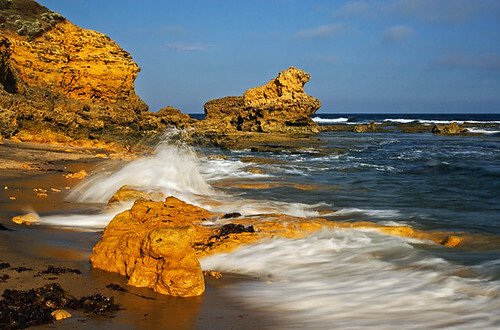 However, with the use of a neutral density filter, it can be achieved. For image #3, I used a B+W brand 64x Neutral Density Filter. This filter reduces the exposure by 6 stops and it allowed me to slow the shutter speed to 1/25sec. As you can see in the image, I have created movement in the water and it's particularly noticeable where the wave hits the rock. 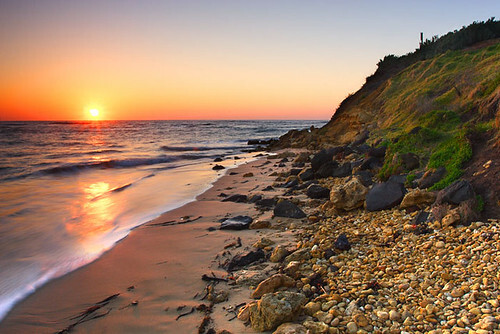 So in summary, use a tripod when photographing your landscape scenes and give yourself time to analyse the scene. 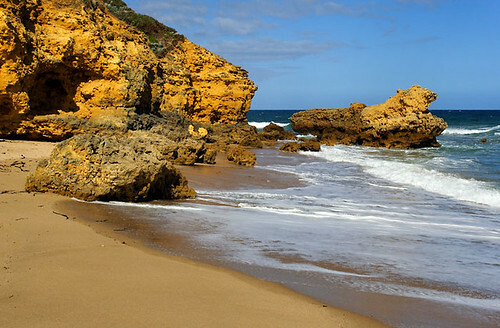 Develop your creative skills and you will create better landscape photographs. 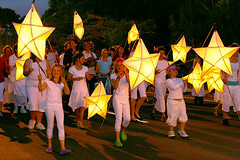 Photographs create visual interest and will enhance your marketing materials and publications. Now is the time to change your promotions with new photographs that will visually communicate to your clients. 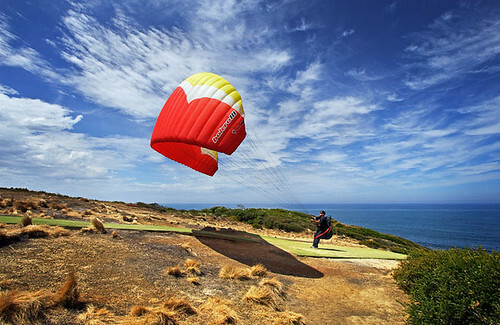 Visit www.darrenstones.com.au and "Stock Photography"
Photographing paragliding action is a real challenge, and I believe the best place to do it on the Surf Coast in Victoria is at Bells Beach Southside, Torquay. Here's a few shots that I think capture the essence of paragliding in this area. 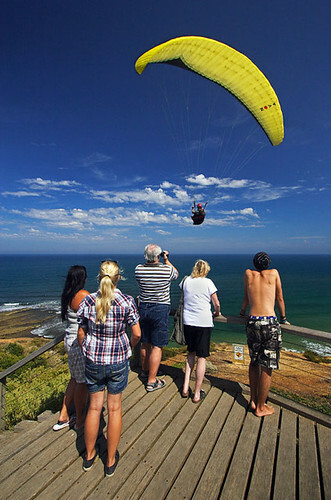 Spectators can see the action close up because the paragliders use the thermals across the cliff top where the viewing area is located. You need to be patient and continually observant, because composing unique photographs can be a bit hit and miss. With people moving, timing is critical. 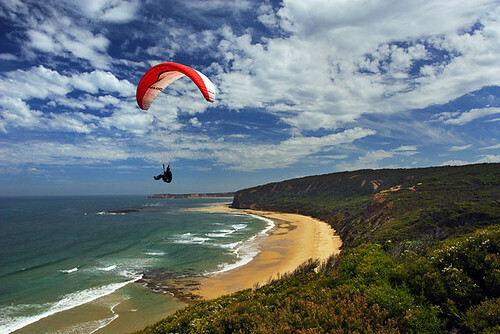 It's a great spectacle to see a paraglider floating on air above the beach. 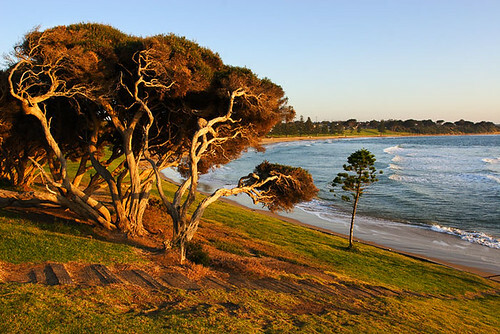 When the backdrop is as brilliant as the Victorian south-west coastline, it makes for awesome photographic opportunities. 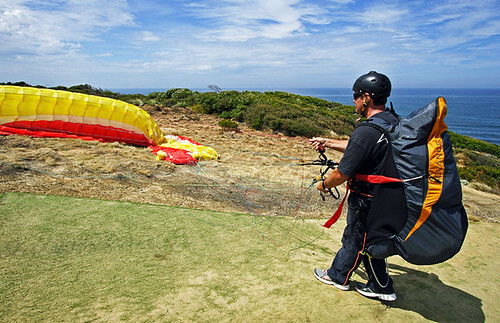 There is the opportunity to get close to the paragliders before they lift off, however I suggest you introduce yourself to them and develop a rapport. Chat to them about their experience and interest in the sport. You can gain a good insight by engaging in conversation. Every so often it's wise to step back and take a wide shot. 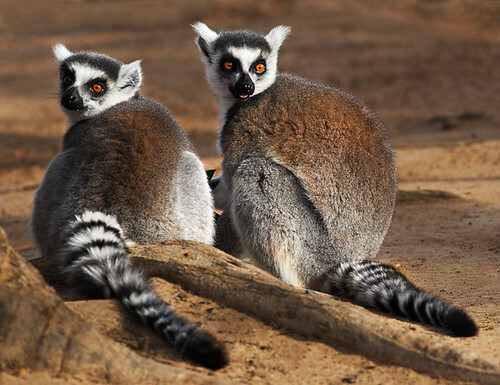 Photographing with a wide angle zoom allows you to take images that include the natural surroundings. Sometimes the sky adds a brilliant background to a scene. 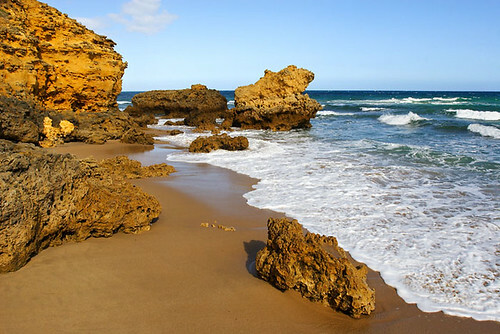 These images were taken using a wide angle zoom lens. By using a wide angle zoom, and getting in close, you can create dramatic images. Are you using professional quality photographs in your marketing materials that enhance your marketing materials, or snapshots that lessen the quality of your promotional efforts? 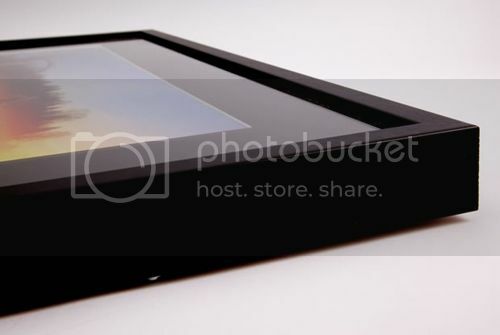 Use professional quality photographs and rotate them on your website and other marketing materials on a regular basis. By doing so, you can better communicate your ideas to your clients and show them that you are active in your business. I offer over 1700 digital photographs for licensing and you can purchase usage rights for your marketing or publishing projects. 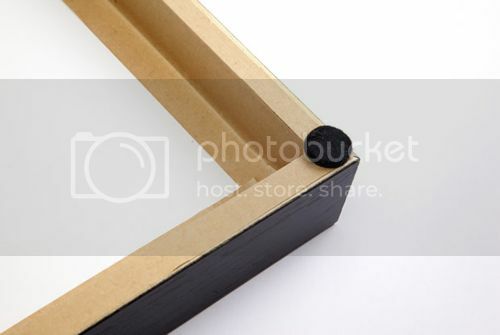 See the Darren Stones Stock Photography catalogue. 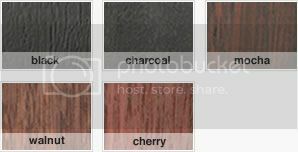 See my Stock Photography page for the full catalogue of images and pricing information. Hi folks, thanks for dropping by to see what is happening around here. If you could spare a minute or two, I would appreciate if you could participate in my Photography Workshop Survey. Your responses will assist me to develop and facilitate photography workshops. Or you may prefer to complete the survey via the embedded survey below. Please note that you may need to click on the written text options in the embedded survey to register your answers. Thank you very much your time and consideration. Please leave a comment or suggestion and let me know your photography interests. Cheers. When photographing the landscape, it's worth spending time in a specific location and working the various angles of that landscape at different times of the day. 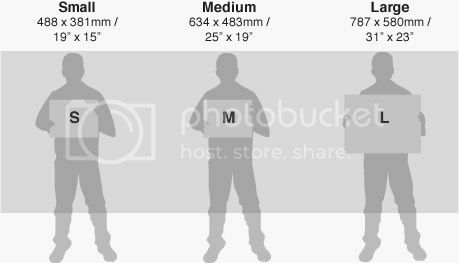 I recommend to closely analyse a small area and investigate the numerous photographic opportunities that an area can provide. 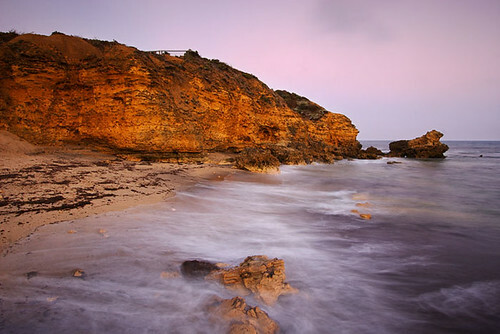 In this article I would like to highlight Cosy Corner at Torquay in Victoria as a place for landscape photographers to practice their craft. 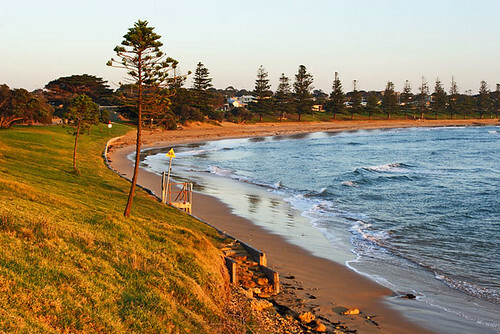 Torquay is a great seaside town for a short break and about one-and-a-half hours from Melbourne. Many hobby photographers have a tendency to rush their landscape photography and want to cover large areas during a short time. I believe it's worth investing time and being patient so you can maximise your chances of covering a small area in a more thorough manner. Even just sitting for 15 minutes can give us time to relax and prepare for an hour of quality photography. When visiting Cosy Corner, I like to park at the car park at Point Danger because access is easy and you can see the weather changing, especially approaching showers and squalls, which can make for interesting images. When I park the car, I always get out and survey what is happening. I look at what the weather is doing, what people are doing and just let the area wash over me. I never get out of the car straight away with the camera and start snapping away in the hope that a good image will magically find its way onto my memory card. A tripod slows down our image making process and I believe that is a key aspect to creating better images. When using a tripod, we can better compose our images and begin to better see what it is we are actually viewing. Rushing around with a camera and just snapping away is not the best way to make a series of quality landscape images. Time ... give yourself time to connect with a location and allow yourself to feel what is actually happening around you. Cosy Corner at Zeally Bay, Torquay in Victoria is a good example of a place where you can return to the same location during a short stay and photograph a variety of subjects and activities within a small area. Different lighting conditions can make a big difference to the scenery around here, and as photographers, this is to our advantage. Changeable weather conditions are great because you can create a series of images where the cloud formations look completely different. 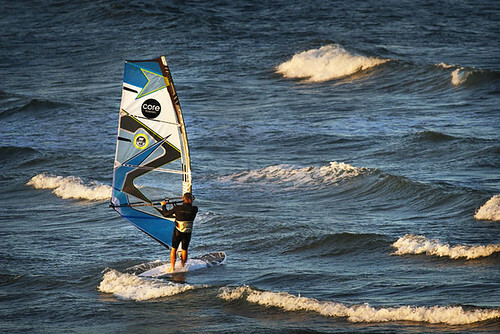 Windsurfing on Zeally Bay during late afternoon sunlight before sunset. Take your time and use the weather conditions to your advantage. 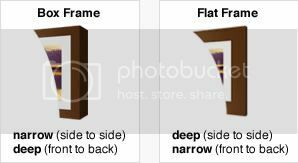 Return to the same location and work the angles during different lighting conditions. The rewards will be worthwhile. 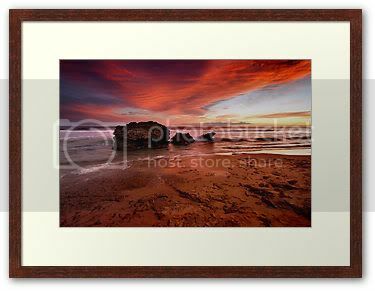 Our professionally crafted ready-to-hang framed prints are made by a picture framing specialist. Enhance your decor by hanging a selection of qualty framed prints. Like us on Facebook to stay informed of photography advice, new products and services. 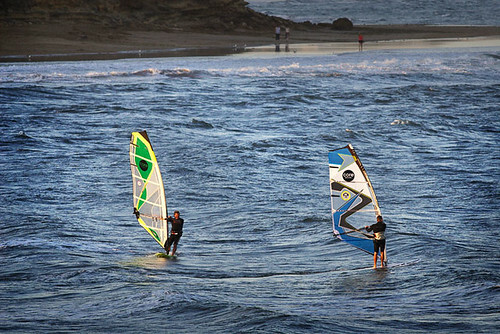 I love heading to the coast to photograph surfing. It's one of the most enjoyable photographic pursuits I partake in and I find it relaxing and a challenge. The rewards for being patient are usually good as most times I come home with images that look okay. 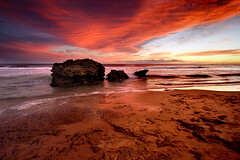 Click on the thumbnails to view a larger size of each image in this collection of Australian surfing photography. 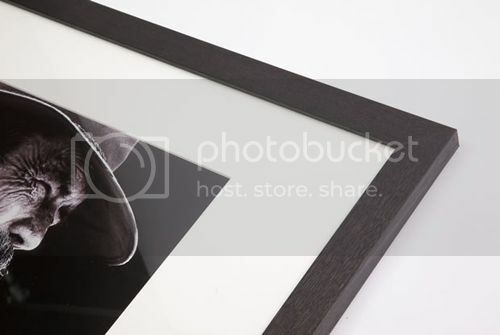 Each image in this collection is available for licensing. Please contact me to discuss your requirements. 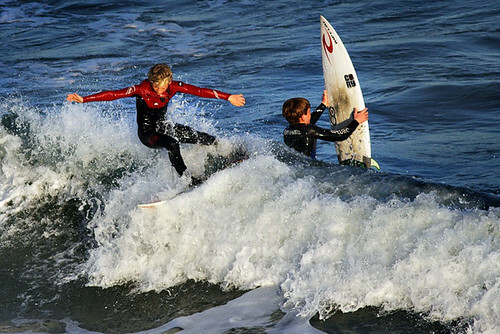 Darren Stones - Surfing, a set on Flickr.